Ever wonder what the next generation of mobile phones hold in store. I'm not talking about 2G, 3G, 3.5G, etc. What will be the big changes in terms of not only connection speeds, but the ergonomics of the phones themselves? Yes, today's kids and more and more adults can text at amazing speeds and even new lingo has been born around texting. However, the tiny keypads and displays are without a doubt a challenge. 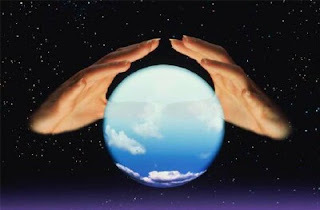 Being somewhat of a gadget freak and of course being involved in Telco Research, I will pull out my crystal ball and give you my best guess at what we might begin to see. Displays as we know them today will remain but will be augmented by miniature projectors. Instead of squinting at the small screen while browsing the internet you can project it on the wall, back of a seat or the table in front of you. This will also be a huge improvement for the elderly and other people who's close up vision is less than perfect. In addition, we will begin to see more and more text-to-voice and voice-to-text capabilities. Text-to-speech will be used to read us chat, SMS, and email messages while we are driving and in other situations where we prefer to listen than to read. This technology exists today, although sometimes the result is a bit too monotonic to be enjoyable. In the future though, who knows, maybe you'll be able to choose your favorite actor's voice to hear your messages. Speech-to-text is a harder nut to crack but progress is being made. We are already starting to see some start ups providing email and SMS transcription services, although they are not yet fully automated. Jott is one such example. 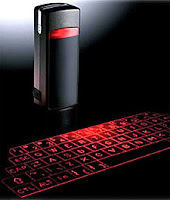 In addition to speech recognition, I believe we will see some interesting breakthroughs in terms of keyboard ergonomics. All of the major han dset vendors are working hard to provide small but comfortable keyboards for their smart phones. However, I believe that in this area the breakthrough will be when they find a way to project a full size keyboard onto a flat surface. I actually found such a gadget that can be connected to your phone via bluetooth, but I've never actually tried it. As for the geaky bluetooth ear pieces that we see on so many people, I'm not sure how their future will pan out. With mobile phones being used as mp3 and mp4 players the desire for stereo ear pieces will increase. Today's stereo bluetooth ear pieces for cell phones have wires, though not connected to the phone, making them less than attractive in my opinion. In addition, music quality is not as high when listening over bluetooth. Here my crystal ball says that someone will develop ear buds that can be put in each ear with no connecting wire, using some new kind of near range communication protocol. In a few years we'll have to come back to this post to see how accurate my crystal ball proved to be. For an interesting wish list related to cell phone chargers, you might want to take a look at this post from Telecopalyse.